Calcifications are the result of chronic inflammatory processes such as occlusal trauma, caries and aging. Gaining entrance into a calcified canal system can be extremely tricky and even impossible at times. 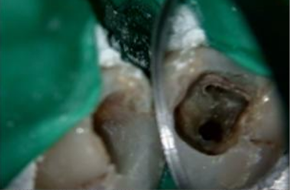 This audiovisual presentation guides you through the various techniques and instruments that can help treat calcified canals. Amir FA, Gutmann JL, Witherspoon DE. Calcific metamorphosis: a challenge in endodontic diagnosis and treatment. Quintessence Int. 2001;32(6):447-55. Krasner P, Rankow HJ. Anatomy of the pulp-chamber floor. J Endod. 2004;30(1):5-16. Schafer KG. Treatment of calcified root canals. Ont Dent. 1996;73(10):21-3.